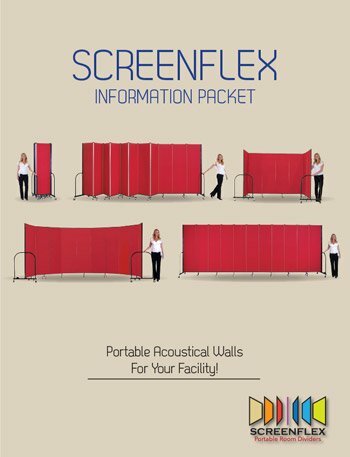 Learn about Screenflex Portable Partition, Inc and the quality focused manufacturing of Portable Room Dividers that are both durable and affordable. John: Hi my name is John Maas, I am the President of Screenflex Portable Partitions. Screenflex Portable Partitions is a manufacturer of our own unique line of room dividing systems. Based here in Lake Zurich, IL, we have everything in one facility. We manufacture, sales, marketing, everything happens out of one facility. It’s our only location. Tom: You know quality really starts with the products that you use to assemble your product. We’ve been working with most of our vendors for well over 20 years. Some of them have been with us right from the start. Quality in equals quality out! By working with vendors and creating partnerships, we ensure that we have the best quality products to put into our own product. John: The freestanding partitions are able to be utilized in any application, you can use then in one building, one room, you can move them around real easily. You have a sound absorbing, fire-resistant, tack-able surface that can be set up anywhere you want. It’s not affected by the light, the ventilation, the sprinkler systems, HVAC. None of that is affected because it is not going from floor to ceiling like many of the other systems are. It’s truly freestanding and flexible. Tom: Our employees are very focused on quality. They get a bonus monthly based on the quality of the product that goes out the door. And I am happy to say that of the twenty plus years that I have been doing this, our employees have only missed that bonus one time. John: It’s unique, it’s different the way it’s made. The panels themselves, they are a combination of four laminations of fiberglass. Why have four laminations? The more laminations you have the stronger the panel is going to be. We make the panels here ourselves. We laminate those together, in those four layers, in a true square format and then other things that carry forward into that and into the structure and stuff like that, is the continuous hinge top to bottom. A continuous hinge connects in multiple points. It is the strongest possible way when you have multiple connections to the panel system. And then I will talk about the legs on the bottom. The legs, while they look all crazy in the way they fold up and interact and stuff like that, there is a logic to what’s actually happening there. And that’s one of the most important features of our product. No matter what configuration, no matter how many panels you fold out, the unit will be stable and strong. While the panels and the legs on the bottom are adjustable, spring loaded, so that they can handle all floor conditions. They allow for a good, stable, strong product that will stand up for many years. Tom: We have an expectation checklist that each product has to pass like I said three times. Then if there are any issues the person responsible for producing that product is also responsible for fixing any issues that may come up. You know I am not happy to throw something in the garbage, but if it isn’t right, I am going to put it in the garbage before I put it in a box and send it to the customer. The materials and parts that we put into a Screenflex Partition have really been over engineered for their use and we spend time researching finishes and materials that we use so that we can ensure that the product, when it’s done, is going to be long-lasting and it’s going to have the same quality today as it will ten years from now. John: The majority of our innovations come from our customers. We listen to our customers. We log what they want in different ways so that if we hear the same question over and over again whether it’s: linking product together, a window in there, fabric treatment, a hanging markerboard, whatever you might want. Or a different color fabric or a different style of fabric, or a fire retardant fabric, or something else along those lines. If you listen to your customers, the customer will tell you what they want. Obviously, airport security is gone greater and greater and they had this constant need to improve airport security, well our current line of partitions don’t allow for much more of a window than a small space. We have a 10″ x 10″ and a 20″ x 20″ window. That’s not large enough for many TSA agents to see through there. They want clear vision, but they want separation from passengers moving through the terminal. We have come out with a line that’s totally clear and that was nothing more than listening to what the customers wanted. In this particular case, TSA agents want visibility, but they don’t want a customer coming through there. Clear products were the same application for factories. A lot of people use the phrase “the best” or we’re the best at this or we’re the best at that. Well, we only do the best! We have the best equipment, we have the best materials. We are not going to skimp on a screw, adhesive, or any of the things that we are going to put together this product on because this thing is going to be around for 10,15,20 years. We want people to buy something that they are going to have like any other piece of furniture they are going to have in their facility. So there are no corners cut on our product. Everything that we utilize and we assemble here in the United States right in our factory obviously is the very best. Because we believe very strongly in supporting ourselves and being able to buy products and materials in the United States, or source our stuff here because it is just something that we believe in, and this opportunity that we have to produce products and sell here. While we sell in other countries, we buy as much as we can here in the United States. One of the philosophies that I carry around here is that we use the word with a lot. With is a word that I believe very strongly that I learned from my father. And the philosophy carries through whether it’s an employee, a customer or a vendor, all those three categories all fall together. They all work with one another. Nobody works for me, everyone works with one another here at Screenflex. We work with our vendors to get the best product so that we can put the best items that we can, product wise for the customer. The customer, they are the final part, but they are the most important part. We work with them to satisfy their needs. So that word with is a very, very important word to me. Industry wise, our biggest two customers continue to be churches and schools. But of course, we reach into government, conventions, and other kinds of facilities that have many different uses, or casinos. crowd control, and different applications. While teaching is very important, well crowd control has become more and more important, or security in an airport and our reach continues to grow. There is no shortcutting the materials. You can start with a good material, then you are going to have a good product in the end. Then how you are putting it together. Whether it’s the machinery or the people you got to put them together in the right order with the right processes with the right temperatures with the right pressures with all the right technology. We’ve spent a crazy amount of time on the package. People are like, it’s just a box. Because the package is not something that is just going to go in the dumpster, it’s going to bring the product to the customer in the best possible shape so that they get it and they can start using it right away. We’re going to sell you the best thing that’s going to last for many, many years. While it many not be the cheapest thing on the block it is going to satisfy your needs in many different ways. It’s no the floor to ceiling partitions that is immovable in that space. It’s not the T-leg office panel system that you can’t move very easily. This thing is easy to move, any kids can set it up. It is going to provide you with sound absorbing, tackable, fire-resistant, strong, light-weight system that’s going to provide a division for your space and privacy whatever you need to have.